Standard shipping covers UPS Ground only. For Next Day or 2nd Day service, please call us at 800-472-3292. 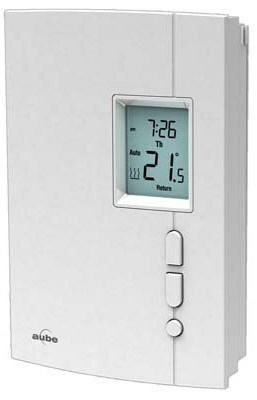 This thermostat can be used to control an electric heating system such as electric baseboard heaters, electric radiant ceiling heaters, electric convectors and electric fan-forced heaters. Comments Backlit, On-screen heating power indicator. Minimum & Maximum temperature locks. Battery-free. Not to be used on central heating systems or systems that have an inductive load, such as boilers or forced-air furnaces.